Warwalking is the pedestrian version of wardriving but in this case we are using an ESP8266+OLED powered by a single lithium 3.2V AA cell. Commonly used in modern solar garden lights 3.2V "AA"
Find one with a switch! Note: Arduino.cc has released 1.6.7 of their IDE and much old code is broken since the underlying compiler is being driven to be stricter on code syntax! Warwalking will not compile as-is and likely much if not all of the ESP8266 code posted here will be at risk. There is simply no way that I can address every change to the IDE: Many of my projects use multiple-tabs and these will be broken but can be fixed easily by specifying forward declarations. In addition, you should read this ESP8266 forum post. Wardriving is the act of searching for Wi-Fi wireless networks by a person in a moving vehicle, using a portable computer, smartphone or personal digital assistant (PDA). Warwalking is my coined term for taking my little ESP8266 battery powered project with an OLED display out for a walk and looking for WiFi open (non-encrypted) hotspots... just for fun or, if public, perhaps for a backup to my home WiFi. Originally, my software "latched" onto the open access point and requested an IP address just to prove the WiFi was truly open; but various laws govern connecting anonymously to private WiFi networks, so the project was changed to simply identify their presence. 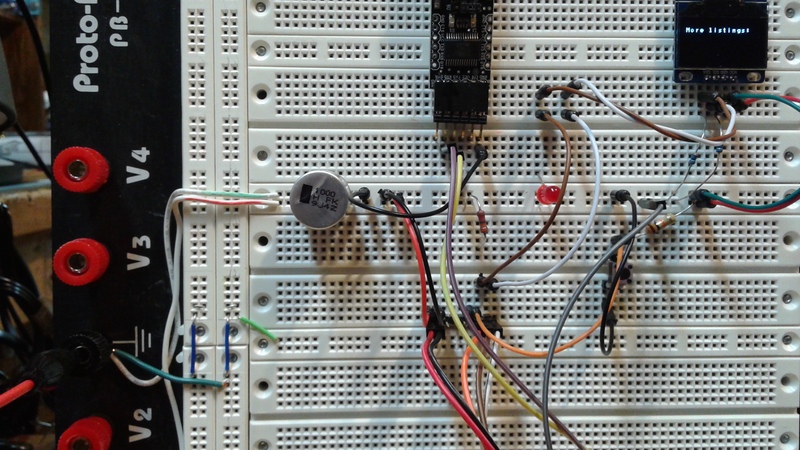 This project builds upon the hardware described in my first ESP8266 post here. Only the software is changed to provide for this new functionality. Great! But, I only want to show those networks that are "Open" and from the list above I know that passworded networks have an asterisk * at the end of the listing. Thus I now have the logic I need to incorporate for the OLED display, I just need to see how the code is handling printing the asterisk! So that was not too hard. I test it on the breadboard, of course, and it works as expected. This is where I would normally leave you, dear reader, with a ZIP of the code and close out the project. But, I really want to play with this more, take it out and about with me on my little walks around the neighborhood and even out to a restaurant or two. I'm planning a trip to New Orleans and will be staying in the French Quarter... an open WiFi finder just sounds like a toy. So, I took this project a step further and put it all into a small AA plastic battery case that has a little switch. I purchased a bunch of these years ago for about 50 cents U.S. each. To make room for the ESP8266, I intend on using a 3.3V LiFePO4 "AA" rechargeable cell. That leaves me with 50% of the interior space and (as you will see) the entire outside of the enclosure. 1 / 9 • Here is the remarkable ESP8266 ready to be boxed!